COWBOY FOOTBALL – Hey eighth graders–are you interested in joining Cowboy Football this fall? Come meet the Canyon High Football players Thursday at lunch to learn more about joining the team. There are meetings this Saturday and next Tuesday. Check out all the INFO HERE. CLUBS AND ACTIVITIES – Today in Clubs and Activities, the Metal Fusion club meets in room 902, the Writers club has the last meeting of the year, and track practice is on the PE fields after school. STAFF VS. STUDENT SOFTBALL – Practice today for the Staff vs. Student softball game. Please meet at lunch on the diamond. RANDOM ACT OF KINDNESS WEEK – Random Acts of Kindness week is here! Lets spread more kindness here at Sierra Vista. Tuesday: Give a shout out to your friend in the Quad! There will be a megaphone for you to use, and tell your friend what you like about them! Wednesday: Write what you appreciate at the Appreciation Station. Come out to the outdoor stage, and there will be a poster for you to write something nice about your friend. Thursday: Give a smile :) Kind actions really do make a difference. Friday: Give a high-five! ASB hopes that you have a kind and awesome week! ASB OFFICER ELECTIONS – The ASB officer elections for the 2018-2019 school year will be taking place this week! Please be respectful of the campaign posters and fliers that will be hung around campus. 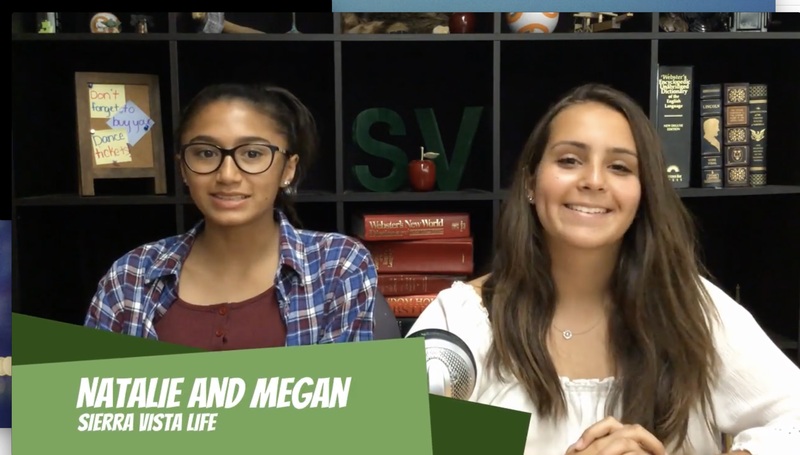 Feel free to check out the officer campaign videos that are featured on the Sierra Vista Life homepage. 7th grade students will be receiving an email on Thursday that contains the link to vote for the officers. The voting window will close on Friday, May 18th, at 2:30pm. The elected officers will be posted by 5pm of that day. Good luck to all of the candidates! SV LIBRARY JOBS – Attention 7th graders: Are you interested in getting some real work experience and paid for your work? Do you like being at our SV Library? Then pick up an application in the library to be a student circulation desk worker for the fall 2018 semester. Work shifts are either before school, or during brunch and lunch one day a week. Applications are due to Mrs. Fulleman by Friday, May 25th at 2:30 p.m.
CANYON CROSS COUNTRY/TRACK – If you are interested in being part of the Cross Country/Track team at Canyon High School, come to our Mandatory meeting at 6:30 pm in Room H-1 on May 22nd. We will be going over Summer schedule, Mammoth Training Camp and Fall schedule. Looking forward in seeing you there. DFY IN SCV – Attention DFY in SCV members: Our final meeting will be held on Monday, May 21st at lunch in the MPR. See you there.